After women reach a certain age, fertility issues can become a problem for those trying to get pregnant. 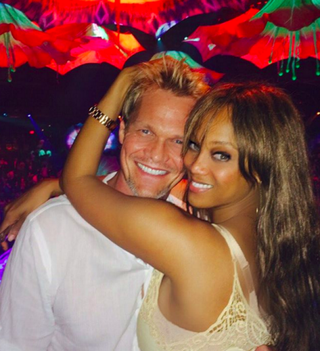 And last year, Tyra Banks spoke about her struggle with fertility on her talk show FabLife. Banks remarked that she was tired of being asked why she didn’t have kids. “I am so tired of seeing on my social media, ‘Why don’t you have kids? Why don’t you have kids?’ You don’t know. You don’t know what I’m going through,” Banks stated. But now, several months later, Banks, 41, and her boyfriend, Norwegian photographer Erik Asla, are celebrating the arrival of their new son, York Banks Asla, who was born via a gestational surrogate. “We are so excited for our new baby boy bundle of joy. The journey to now has not been an easy process, as I’ve shared before. But there was a beautiful bright light at the end of the tunnel for me and his father, Erik,” Banks told People magazine. With a simple photo of a baby boy’s hat on Instagram, Banks shared the news with her followers. Congratulations to Banks and her boyfriend!